One of the best boxing movies ever cranked out by Hollywood, Raoul Walsh’s Gentlemen Jim offers a glimpse at the roots of the sport in its modern incarnation. A biopic of “Gentleman” Jim Corbett, the film features Errol Flynn in one of his most appealing performances. Capable of embodying both Corbett’s athleticism and his dandyism, the star is exceptionally well-cast. His Jim is brash and bold, a prototypical movie hero. Imbuing Corbett with no small amount of charisma, Flynn carries the movie with seeming effortlessness, turning it into a jaunty and consistently entertaining chronicle of an underdog’s rise to fame. Impressive production values abound here, convincingly recreating both the San Francisco slums that young Jim called home and the high society circles he finds himself in as he gains notoriety. Walsh strives at every opportunity to show off the scale of his sets and the number of extras he’s hired. What’s likely to leave the biggest impression on viewers, though, are the extended boxing scenes. They take up a large portion of the movie, but never drag down the narrative, since they realistically depict the evolution of pugilism from family tussles, to bare-knuckled street fights, to a refined form of brutality finally classifiable as a sport. They make plain Corbett’s contribution to the sport, contrasting Flynn’s graceful movements with those of his competitors. Gentleman Jim is memorable not just for its well-mounted slugfests, but also for nuance of character. There’s only one man’s name in the title, but there are a whole community’s perspectives present to surprise us. Walsh’s broader view comes into play at moments like the one at the dinner table, where a priest masks his laugh, in the sly insinuation that the best friend played by Jack Carson is merely sycophantic, or in the moving concluding soliloquy, in which Jim considers the feelings of the defeated champ. These are typical of the small observations that greatly enhance Gentleman Jim, infusing a familiar plot structure with real vigor. Gentleman Jim asks its audience to embrace a thoroughly arrogant man, and thanks to Flynn’s presence, we’re happy to. Walsh trusts his viewers to value ability and wit over humility and pathos, resulting in one of the most roundly entertaining of all sports films. 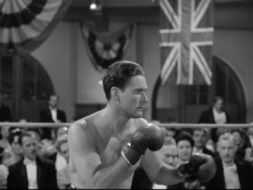 Whether showing Flynn’s Corbett physically dance around his opponents in the ring or verbally dance around socialites outside of the ring, the film has an undeniable and infectious cocky charm.